It’s been more than two and a half years since Metro 2033 quietly took players into the rotting underworld of post-nuclear war Moscow, and fans of that game’s brutal world have been patiently waiting for its sequel, Metro: Last Light, to come out. 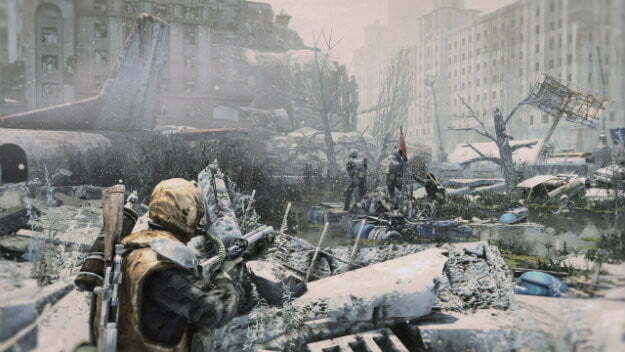 The likelihood of an on-time release in 2013 was increased when developer 4A Games announced that it would no longer ship Metro: Last Light with a multiplayer component. In a post on its official blog, 4A clarified why it was returning the series’ focus to single player content. 4A Games is making a bold choice to abandon a multiplayer mode in its game, as is publisher THQ for supporting them. Popular opinion in the video game publishing business is that video games need some kind of multiplayer component, even if it’s not campaign based, to succeed. Electronic Arts and developer Insomniac have both said recently that they will no longer pursue game development that doesn’t have some kind of social feature. 4A is making the right choice though. For all of Metro 2033’s failures, its greatest success was in the private world it created in its campaign, and its best that the series foster and preserve that signature style. Single player-only games can still succeed in the market. Look no further than Skyrim’s spectacular sales over the past year for evidence. Last Light has only made sporadic public appearances since it was announced in 2010 as Metro 2034. It was at E3 2011 under its current name, but it was delayed in February of this year, pushed in to 2013. It was at E3 2012—and we were dually impressed by it—but the game was in extremely rough shape. Now that we know 4A has devoted all its resources to working on that campaign, we can have more faith in the project.